Decorative stickers, beads, buttons, etc. 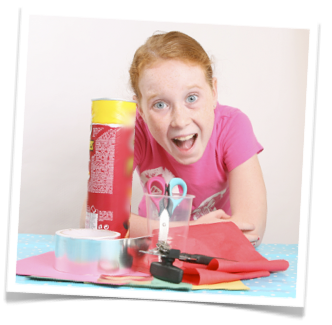 It is so much fun to make your own magic tricks and these step-by-step instructions are going to help you do just that. Soft plastic drinking cups are the best to use to make this trick as they are very easy to cut to make the gimmick. Ask an adult to help if you find it difficult to make the first cut. Using an empty snack food cardboard tube works really well as it is the perfect size for this magic trick. You can use any decoration tape or stickers to add a ‘magical’ effect. 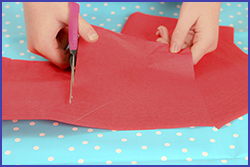 Tissue paper is very thin and tears really easily, so take extra care when you are working with it. 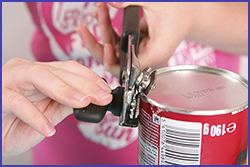 Remove the bottom of the cardboard tube with the can opener. You may need some help from an adult with this bit. Make sure there are no sharp edges. With the bottom removed you now have the perfect tube. The next step is to decorate the tube. The first thing to do is to cover the back of a coloured piece of paper with glue stick. When you cover the whole area you will get a smooth finish on your tube. If you just glue the edges, it may bubble in the middle. Don’t worry if your paper doesn’t cover the whole tube top to bottom. Use decorative tape or strips of different coloured paper to cover the bits that are sticking out. Now it is time to decorate your tube with decorative tape, stickers, beads, buttons or anything you want to use for a ‘magical’ look. I have found electrical tape works really well as it is a bit stretchy and gives you a very smooth finish around the tube. Take your time with this bit, because this is what your audience will be looking at. Cut 4 squares out of your tissue paper. You want to make them about 20 x 20 cm. Tissue paper is very thin and tears really easily, so take care when doing this step. Ask for help from and adult if you need it. Cut a few extra squares for spares as they may rip when you get to use them in the next step. Place one of the tissue paper squares on top of the plastic cup (as shown in the picture). 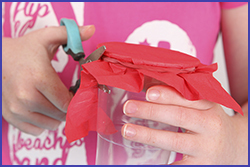 Take one of your elastic bands and fit it over the paper over the opening of the plastic cup. It should look a bit like a drum (that’s why this trick is called the Drum Tube). This will be the ‘sneaky bit’ that the audience won’t see. Trim the extra bits of tissue paper off. This important as this will make sure the audience doesn’t see the ‘gimmick’ (the ‘sneaky bit’ that the audience don’t see). 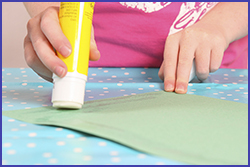 Now place a square of tissue paper over one end of your decorated tube and repeat Step 5 by placing the elastic band over the paper and the tube to make another ‘drum’. Take care doing this, remember the tissue paper rips easily. Ask someone to help by holding the paper while you put the elastic over the tube. You have done it! You have learnt how to make your own magic tricks. Have fun with this amazing prop: the Drum Tube. It can be used to appear all sorts of weird and wonderful things. See what you can make appear from your Drum Tube. 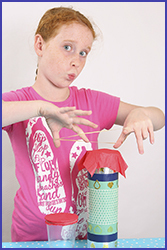 My 7 year-old came home to tell me that she signed up to be in the talent show at school as a magician and so, I decided to put together a routine for her from these tricks since the ones we have are more close up in nature (thumb silk, etc.). I can get the instructions from this post, but thought you’d like to know that the pdf link doesn’t seem to work in this post like the others. Great work (and btw, I heard about you from Smart Passive Income). I tried this trick for my grandsons, they were amazed, as the candy poured from the tube. Then, they were no longer interested in the magic, but in eating the candy. A fantastic closer! Thank you. You and Julian are doing a great favor to our grandchildren and to Magic itself. All of the kids we know are very happy to get so many nice tricks from you. and a lot of thanks. One little problem: it has been impossible for us to get the instructions to make the gimmicks for the different tricks when we press the bottoms. What could it be? What a great troop you’ve made sharing all of your knowledge for entertaining. Thanks you so much Julian, Ken and of course Kristan. 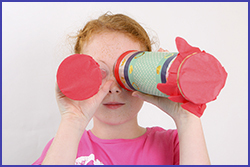 This is a great trick for the grandkids and adaptable for other older kids. Thank you Ken and Julian for sharing these tricks with us.